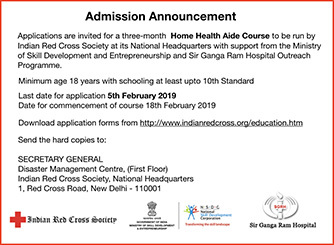 With the growing need for Health Care Attendant in the society for serving the elderly, disabled and critically ill persons at home Indian Red Cross Society is prepared to start Home Health Aide Course in collaboration with Ministry of Skill Development and Entrepreneurship, Sir Ganga Ram Hospital and Safdarjang Hospital. 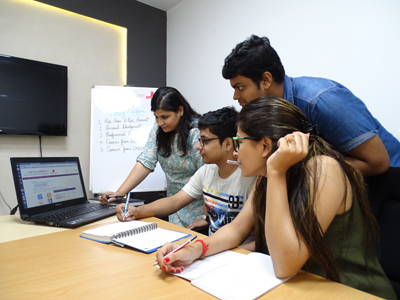 The aim of the course is to impart skill to young men and women from the community to render Home Health Care to the needy and to empower youth with skill sets that will make them self reliant and employable. The inauguration of first batch will be held on 15.4.2019. 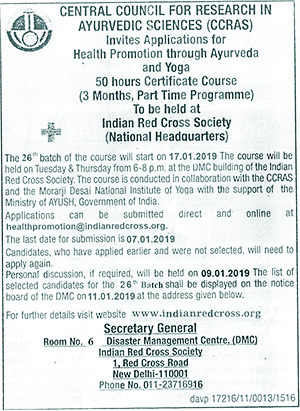 Applications are open for Health Promotion through Ayurveda and Yoga certificate course that will be held on Tuesdays & Thursdays from 6-8 p.m. at the DMC building of the Indian Red Cross Society. The 50-hour will be conducted in collaboration with the CCRAS and the Morarji Desai National Institute of Yoga with the support of the Ministry of AYUSH, Government of India. The last date of submission is 7th January 2019. The 26thbatch will commence on 17th January 2018. 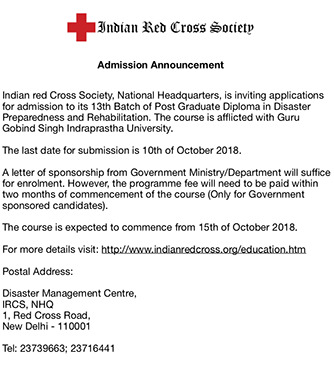 Applications are invited for admission to the 13th batch of the PG Diploma course in Disaster Preparedness and Rehabilitation. The last date of receipt of applications is 31st October 2018. Click here to download the application and sponsorship forms.